RP64095CZ is rated 1.7 out of 5 by 17. Rated 1 out of 5 by Chris from Leaking at the swivel point Seems to be a recurring theme, unfortunately. Mine is leaking at the swivel point as well. 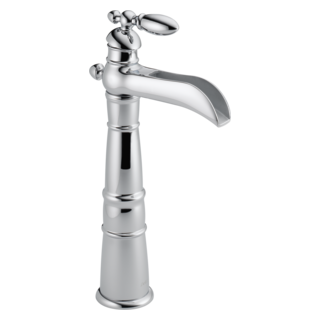 Have many other Delta faucets, shower heads without issue. Rated 1 out of 5 by Kris from Leaks I have had this shower head for a few years, and the problem with water leaking around the edge has gotten worse. Recently, I turned it on, and water from around the edge sprayed everywhere. I have other Delta products that have held up for more than twenty years without any problems. A plumber told me it needed replacing. 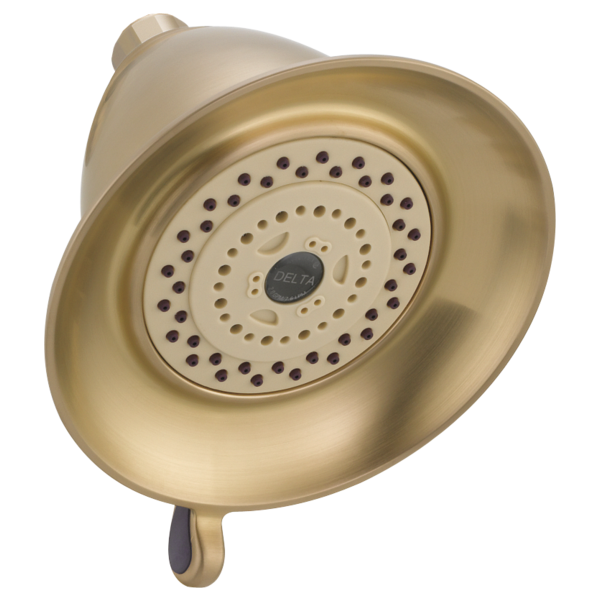 Rated 1 out of 5 by WildGreekPilot from Looked nice but leak like a sieve I have 3 of these shower heads in oiled bronze. All three leak. I didn’t use one for a week while out of town and you would have thought I punched a hole in the body of it. Reading reviews it seems to be a very common problem with the spray selector seal. Unfortunate. Would give zero stars if it were an option. Also couldn’t find a parts diagram to replace the seal itself. Design flaw. Rated 1 out of 5 by BBmn from Leaks We have the oil rubbed bronze model. Shower head leaks around the dial. Sounds like a common problem. Very disappointed. Wonder if it can be repaired? Rated 2 out of 5 by Gius from Leaks I have three of the same model and they all leak at the connection of the rotating dial. It’s obviously a design flaw. I’ve soaked one overnight in water and vinegar but still has the same problem. It’s likely a seal problem. I’ve noticed that if the shower is not used for a long time the problem gets worse. Rated 2 out of 5 by Gary from Same leak around rim as others describe. The shower head is leaking around the rim that has gone on for years. I've not done anything bc I can no longer match the delta color..it was a satin nickel but had a brassy hue. Am also having trouble opening plugged jet holes without taking off wall and attempting to soak in a calcium treatment. Rated 3 out of 5 by Cookielady from Leaking We have had the oiled bronze head as well as others and are experiencing the same leaking at the same failure point. 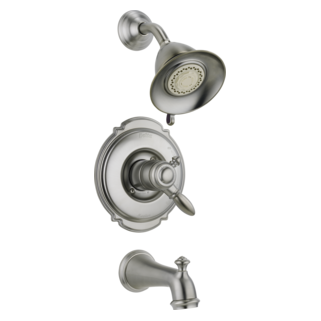 Is our main household shower head but expect more from the quality of a Delta products. We would like to be able to fix this leaking issue. Rated 2 out of 5 by RMG_ from Leaking Shower Head I have the Oil Rubbed Bronze shower heads in this model in 4 of my bathrooms, 2 of them are leaking from the sides. I searched all over YouTube trying to find a way to fix it without having to replace the heads (they're fairly expensive). There has to be a washer that can be changed out to fix this problem. Seems like many people are having the same issues and Delta should be able to figure out a way to fix this problem. 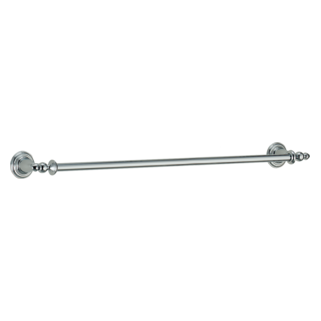 What is the size of the pipe that this shower head (RP64095CZ) screws onto? It's intended to replace a Delta shower head that we purchased back in 2004 that looks very similar to this one, but this new one is just a little different so I want to make sure it will fit. My shower head is spraying out the side when on. Not from threads! Pressure is good and just over 72 psi. Is there new seals or do I need replace the whole shower head? It seems the shower head has two pieces, it should have a seal? How can I change the shower spray setting on my new Delta Victorian shower head? Nothing on the face of the shower head moves at all or slides right or left. I know this has 3 spray settings but I can't see how to adjust the spray setting. Help!